Students need super-smart tools to help them thrive in today’s tech-driven world. 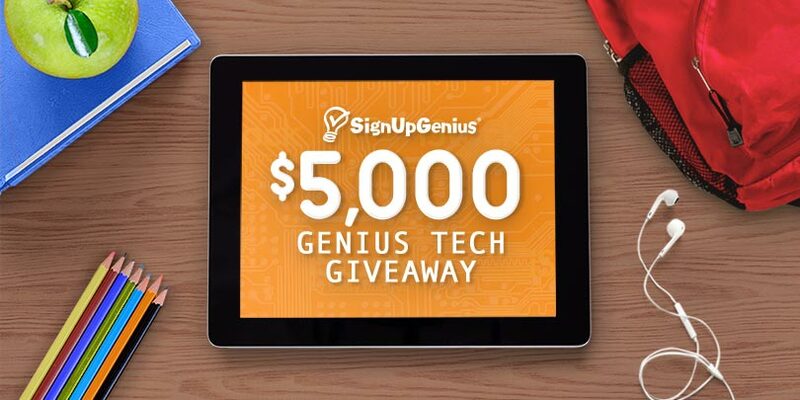 That’s why we’re giving you the chance to power up your favorite school in SignUpGenius’ $5,000 Genius Tech Giveaway. SignUpGenius has already super-charged the way parents and schools recruit volunteers, fundraise and plan events. Now we're empowering future generations. Nominate your favorite school today for a chance to win big, and earn some extra back-to-school cash for yourself. Check back after 9/18/17 to see if your school won! Giveaway promotional period is 8/1/17 – 9/15/17. By entering and participating in the Genius Tech Giveaway, participant (“Entrant”) fully and unconditionally agrees to accept and be bound by these “Official Rules” and by all decisions of SignUpGenius (“Sponsor”), which include, without limitation, decisions regarding eligibility, winners and the interpretation of the terms used in these Official Rules, which shall be final and binding in all respects. 1. NO PURCHASE OR PAYMENT NECESSARY TO ENTER OR WIN. Log on to https://www.signupgenius.com/about/2017-back-to-school-technology-giveaway.cfm (the “Giveaway Page”) between 12:00:00 am EST on 8/1/2017 and 11:59:59 pm EST on 9/15/2017 (the "Promotion Period") and follow the instructions posted on the Genius Tech Giveaway Page to enter via the Rafflecopter entry form. 2. ENTRY DETAILS: An Entrant may submit one (1) Set of Rafflecopter entries per email address. Each Entrant will be required to: a) nominate one “Favorite School” by providing the name of the school and b) provide the City and State in which the school is located. Additional entries may be earned by completing selected tasks through the Rafflecopter entry form on the Giveaway Page, such as, but not limited to: Answer a designated question, Join the SignUpGenius email list, “Visit” SignUpGenius on Facebook, Follow @SignUpGenius on Pinterest, Pin an Image from SignUpGenius.com, Follow @SignUpGenius on Twitter, Tweet about the Giveaway, Follow @SignUpGenius on Instagram. Daily entries can be earned with the “Tweet about Giveaway” entry option. An Entrant may submit daily entries by nominating a Favorite School each day through the entire giveaway period. 3. ELIGIBILITY: To be eligible to enter the Genius Tech Giveaway, an Entrant must be eighteen (18) years of age or older, live in the continental U.S. and have a valid email address. Limit one (1) Rafflecopter entry set per eligible person. If more than one entry form is submitted per eligible person, all entries submitted by that Entrant will be deemed invalid. All entries submitted by individuals younger than eighteen (18) years of age will be deemed invalid. If more or less information is submitted in the entry than what has been requested, an entry may be deemed invalid. All entries must be received during the Promotion Period to be eligible for a prize.To be eligible for giveaway prizes, a nominated Favorite School must be a currently recognized school. For the purpose of this giveaway a “recognized school” a) must have student enrollment of more than 50 students, and b) must be a recognized school within a community. Sponsor reserves the right to decide what constitutes a “recognized school.” Entrant represents and warrants that all information provided by Entrant in connection with the Genius Tech Giveaway is true, accurate and complete as of the date of entry.Sponsor reserves the right, at any time and in their sole discretion, to disqualify and/or deem an Entrant or entry ineligible to participate in the Genius Tech Giveaway. 4. PRIZE: One (1) Winning Entrant will be selected via random drawing on or before 9/20/2017. The Winning Entrant will receive a Visa gift card in the amount of $250. The Grand Prize Winning School will receive a $5,000 check. The Grand Prize Winning School may not substitute, assign or transfer prize. Odds of winning are based on total number of entries received within Promotion Period. 5. GENERAL PRIZE CONDITIONS / PRIZE CLAIMS: The Winning Entrant will be notified via the email address submitted through their Rafflecopter entry following entry validation. If SignUpGenius is unable to contact a giveaway winner from entry information within five (5) days of the contest end, the contest winner forfeits his/her prize and another Winning Entrant will be selected via random drawing. The Winning Entrant will be expected to provide additional contact information for the Grand Prize Winning School nominated if necessary. The Winning Entrant and Grand Prize Winning School will receive their prize within four (4) weeks of the giveaway end. No substitution, assignment or transfer of any prizes will be permitted, except at the sole discretion of SignUpGenius, which reserves the right to substitute a prize or prize component with cash or another prize of comparable or greater value. By entering this giveaway, each potential winner consents to the use of his or her name and Favorite School name for publicity purposes by SignUpGenius without additional compensation or permission, where permitted by law. If prize is forfeited for any reason, SignUpGenius reserves the right to award the prize to an alternate potential winner from among the remaining eligible entries.